On behalf of the European Group of Institutes of Navigation (EUGIN), the Austrian Institute of Navigation (OVN) is organising the European Navigation Conference in 2013. The ENC 2013 will be the seventeenth conference in the GNSS series which have been organised by the European Institutes annually. The conference is focusing on the present status as well as on future developments in navigation systems, with special emphasis on Galileo. Thus, ENC 2013 will be a showcase for state of the art and, more important, for innovations in the field of terrestrial and satellite navigation. The implementation of new technologies in navigation will be illustrated by the industry exhibition, running in parallel to the conference. 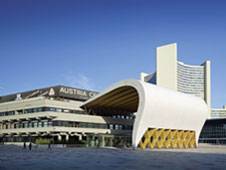 The conference will be held in the city of Vienna. Vienna is located in the very heart of Europe and it is truly diverse. World-wide, this city is known for its long history of art, culture, science and education – attracting millions of visitors every year. Vienna is also a very green city, covered with acres of forests, grassland, parks and gardens. This framework forms an ideal basis for ENC 2013 and will make the social programme of the conference an unforgettable event for participants and accompanying guests. We would like to invite all of you to take part at the European Navigation Conference in the very heart of Europe.